Last month at MWC Shanghai 2017, Qualcomm announced a new range of ultrasonic fingerprint solutions with the introduction of “Qualcomm Fingerprint Sensors”. The new solution allows OEMs to implement a fingerprint sensor under display, glass, or metal. At the time, Qualcomm said that it would be collaborating with Vivo to demonstrate its Qualcomm Fingerprint Sensor for Display and Metal. However, up until now, we never got a chance to see how this new solution will look like on an actual device. Thankfully, the Chinese smartphone OEM, Vivo, has posted a video on its official YouTube channel that shows this new technology in action. 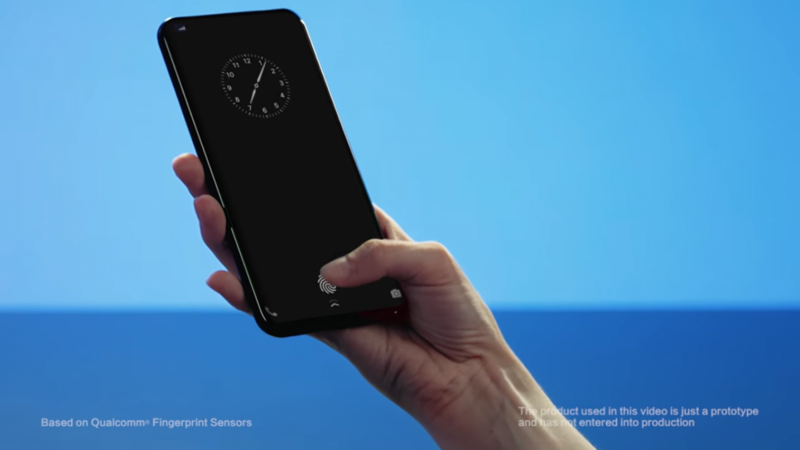 As you can see in the video below, the device in question features an ultrasonic fingerprint scanner that is hidden under the display, enabling the user to unlock the device just by placing a thumb or finger on the display. The under-display scanner makes use of ultrasonic signals that can scan through an OLED panel up to 1200 μm thick. Additionally, the sensor works even with wet fingers and can also detect heart rate and blood flow. While Vivo is the first OEM to demonstrate this new solution, luckily, it will not be the only one to take advantage of it. Qualcomm says the new solution is designed to be compatible with all future Snapdragon Platforms and will work with non-Snapdragon chipsets as well. Although the new solution is impressive, it also suffers from several sore points. One of the major drawbacks of using a under-display sensor right now is that it reportedly doesn’t scan quite as fast as a capacitive fingerprint scanner. Also, the new solution only works when implemented on an OLED panel, leaving LCD displays out of the luck. On the up side, the new solution will open up the doors for flexible designs since OEMs wouldn’t have to drill a hole to add in a fingerprint scanner. This technology is expected to be available in commercial devices in the first half of 2018.